The Reticulated Spine is the northern region of Shadowfen. 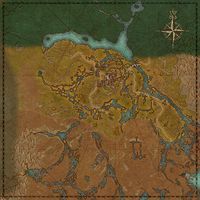 The city of Stormhold sits at its center, and the villages of Stillrise and Mud Tree are also found here to the southwest and south of the city. The Reticulated Spine Dolmen lies to the west and slightly south of Stormhold. Deshaan borders to the north. To the south are the Venomous Fens and Leafwater. ​ The Skin-Stealer's Lair 5 Destroy the Dominion's ability to create Skin-Stealers. This page was last modified on 10 November 2017, at 19:19.